To All Soccer Fans Out There! The latest Winning Eleven arcade title was released. Arcade Championship 2010 is the latest entry in the arcade Winning Eleven series, and a follow up to Arcade Championship 2008. - Real Time Player Substitution system which lets you specify player substitutions whenever you like. These systems use the game's touch screen. The game also includes a Tag Play mode. 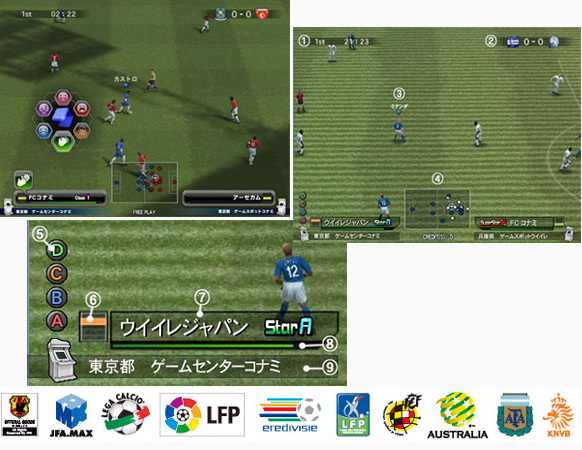 Two players can use two cabinets to control a single team together. Following the match, the game gives you a "Sychro Rate," indicating your compatibility. Purchase a NEW! KONAMI E-Amusement Data Card which is easily available at our counter to build and store your own master league team and data! SHOW OFF YOUR FLICKS/ SKILLS, SCORE OUTRAGEOUS FREE-KICKS, BUILD YOUR OWN DREAM TEAM AND RISE TO THE TOP OF THE ONLINE RANKING LIST! ROCK N' BALL is catered for the younger ones! AIM & SHOOT LIKE A PRO! Our NEW BASKETBALL game, ROCK DINOSAUR (Superb Shooter)! Solo or Link-Play mode is available. TRY TO SET THE HIGHEST SCORE AGAIN! HEY Soccer fans... 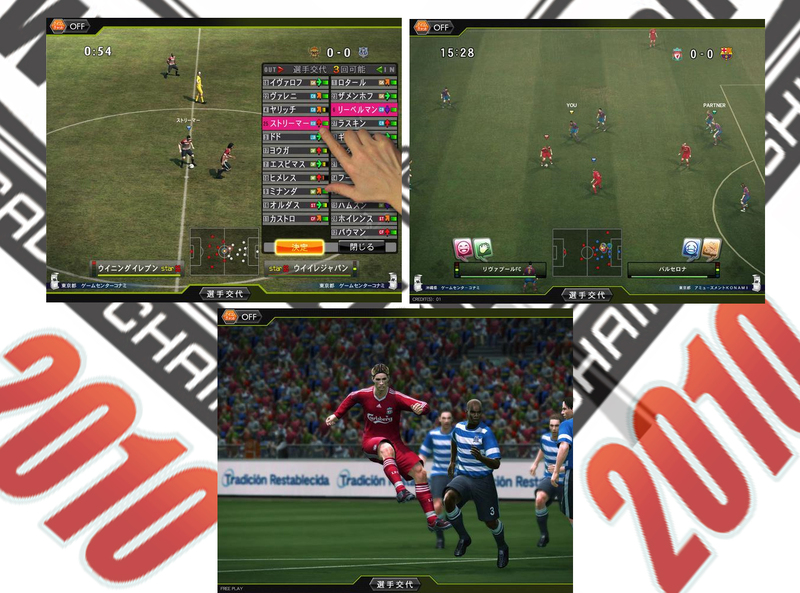 Bored of playing Winning Eleven alone or with a friend or two at home? 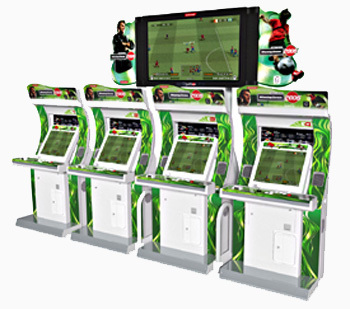 The MOST POPULAR soccer game series, WINNING ELEVEN 2008 ARCADE CHAMPIONSHIP kicks the ball into town! Play with your friends or with some other in-house players in our arcade. 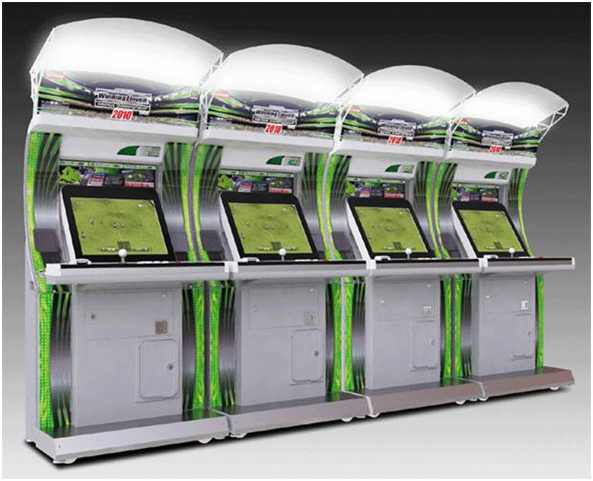 However, if you are feeling adventurous enough, CHALLENGE the online players all the way from JAPAN! Words of Caution: They are damn good in it! Purchase a KONAMI E-Amusement Data Card which is easily available at our counter to build and store your own master league team and data! Recruit players like RONALDO, MESSI, RONALDINHO etc by using transfer points that you earned after each match! 3 Main Modes available: (1) Vs Com only (2) Vs In-House players (3) Online Play. There is a NEW fun feature where you can show your "EMOTION" to your opponent by gently touching on the cabinet's screen! For instance, show him an ANGRY emotion icon after he/she committed a nasty foul when you were through on GOAL! Not used to playing the game with joysticks and buttons? No worries as we provide PlayStation 2 controllers for each playing cabinet! SHOW OFF YOUR FLICKS/ SKILLS, SCORE OUTRAGEOUS FREE-KICKS, BUILD YOUR OWN DREAM TEAM AND RISE TO THE TOP OF THE ONLINE RANKING LIST! 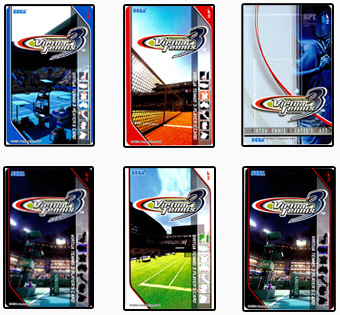 VIRTUA TENNIS 3 is going to blaze a trail in sports games. Building on the adrenalin-pumping action of its predecessors, this is a true next generation game. The realism is awesome and the gameplay is thrilling! The biggest tennis stars are here, and you can play as them or play against them. Top men like Roger Federer, current Men World No 1 - Rafael Nadal, Andy Roddick etc. Among the women, choose the gorgeous Maria Sharapova, Amelia Mauresmo, Venus Williams and many more. The smooth, simple playability of this game means anyone can pick it up, but be WARNED, it's SUPER ADDICTIVE! Use your racket to swing for a LOB or a SERVE, and down for SLICES or TOPSPIN. Your PACE will influence shots, that's what make rallies so lifelike and electrifying. Explore different tactics to OUTWIT your opponent. And as you get better, the going get harder. Choose players wisely as they've all got different strengths. Everything's so realistic, you'll soon realise why VIRTUA TENNIS 3 wins game, set and match! 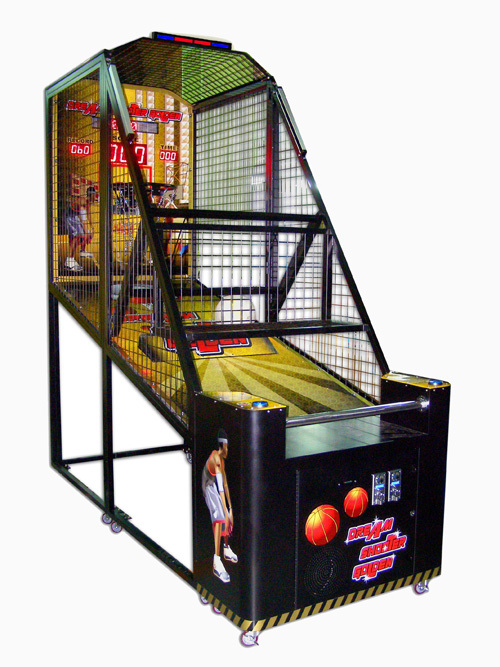 Wanna test your basketball shooting skills? 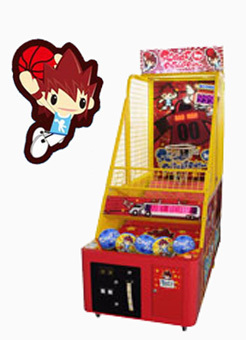 DREAM SHOOTER GOLDEN provides Single Play mode or Link Play mode up to 2 players at a time! The hoop will start to move when the stage gets harder! COME ON DOWN TO BREAK THE RECORD POINTS! YOU ARE ON FIRE!!! A new table soccer game has arrived in our arcade! 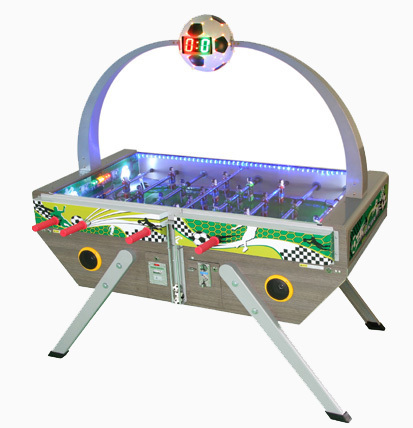 To enhance playing experience, KICK TIME is embedded with INTERACTIVE SOUND and LIGHT EFFECTS which is slightly different from the traditional table soccer you usually see! CHALLENGE WITH A FEW FRIENDS TO SEE WHO IS BETTER! GOAL!!! Attention to all parents as well as children! STREET BASKETBALL XS is especially designed for the younger ones! AIM, SHOOT & SCORE!